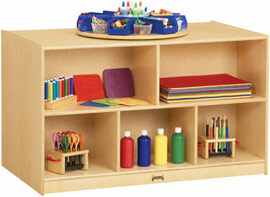 An easy-to-clean tabletop plus loads of shelf space make this mobile storage island ideal for most classrooms. Caster mounted for easy movement. 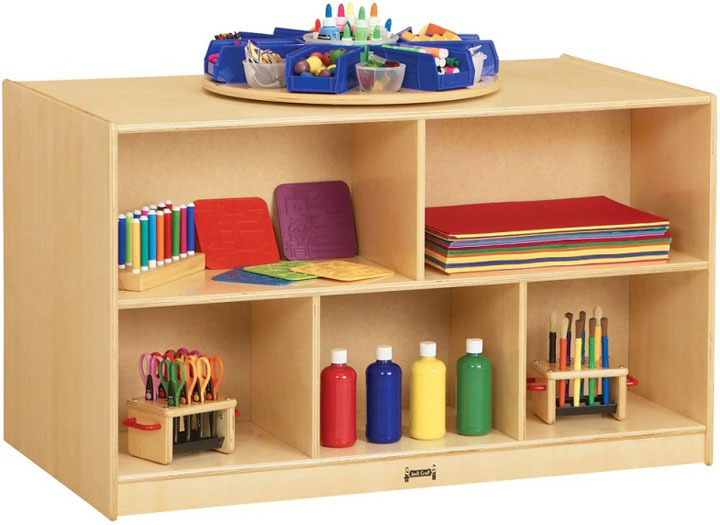 Both sides feature five roomy shelves (48" wide x 28" deep x 29½" high). KydzSafe® rounded edges and corners. KydzStrong® construction. Extra durable, non-toxic and lead-free KydzTuff® finish that will not yellow. This unit ships fully assembled and includes a lifetime factory warranty. MOBILE DOUBLE ISLAND: 48" Wide x 28" Deep x 29½" High, Shpg. Wt.= 120 lbs.